Time of Origin: Future, exact time unspecified. Appearances: "The Krotons", "Return of the Krotons", "Alien Bodies"
History: The Krotons were easily one of the most interesting races The Doctor has ever encountered. Evolving from predatory quasi-organic tellurium-based crystals, the Krotons developed the ability to mimic the movements of their prey, eventually achieving some degree of sentience after mimicking a human Servo-Robot, developing a dependence on the mental vibrations of other beings to sustain themselves. Their weapons are also highly developed, to the extent that a Kroton gun could be capable of damaging the TARDIS itself (Only for the TARDIS to activate the HADS and relocate to another area when the Krotons attempted to fire on it). The Doctor first met the Krotons in his second incarnation, when he arrived on a planet inhabited by the Gonds, who provided their unseen masters, the Krotons, with their brightest intelligences to act as ‘companions’, the Krotons having decimated the Gonds’ world centuries ago and subsequently keeping their knowledge of areas such as chemistry limited. Having rescued one of the latest companions after the death of the other shortly after their arrival, The Doctor was able to convince the Gonds to help him rebel against the Krotons’ malign influence. Having failed in a direct attack on the Krotons’ Teaching Machines - the means via which the Krotons selected their companions - The Doctor and his companion Zoe accessed the Teaching Machines and became the Krotons’ new companions, subsequently being subjected to a mental attack in the Dynatrope to allow the Krotons to draw on their mental energy and create new Krotons. Fortunately, The Doctor’s arrival had stirred up rebellion among the Gonds in the form of Eelek and Axus, two formerly loyal councillors, but their arrogance blinded them to more subtle means of victory. Selris, the former leader before he was deposed in the rebellion, was able to attack the Krotons’ headquarters by attacking their foundations, recognising the futility of a frontal assault, only to be captured by Eelek before he could carry out his plan. Although Eelek attempted to negotiate with the Krotons, promising to give them The Doctor and Zoe if they left the planet, Selris sacrificed himself to give The Doctor a phial of acid that he was able to add to the Kroton vats while Jamie and the Gond scientist Beta attacked the outside of the ship with sulphuric acid. As a result of this simultaneous assault, the tellurium-based Krotons were destroyed, the Dyantrope collapsing as the Gonds were freed at last, The Doctor and his companions departing after Thara, Selris’s son, was appointed leader. The Doctor encountered the Krotons once again during his sixth incarnation, currently accompanied by new companion Charley Pollard (Although their relationship was complicated by the fact that Charley had previously travelled with the Eighth Doctor and was thus now constantly trying to avoid revealing her knowledge of The Doctor’s future to him). Arriving on the colony world Onyakis, shortly after the solar flares that devastated Earth in the thirtieth century ("The Ark in Space"), The Doctor and Charley discovered that a group of colony ships had landed on the planet on the commander’s insistence despite its relatively inhospitable environment, experimenting with some kind of teaching machine and the crystal power source K-7, which colony leader Cobden claimed could help them survive but so far had turned up no signs of having any practical purpose. Discovering a spaceship during a ‘cave-in’ - really a demolition planned to conceal evidence - The Doctor entered the ship and recognised it as Kroton manufacture, albeit more advanced than they had possessed during his previous encounter with them, and realised that ‘K-7’ was actually dormant Krotons. Although too late to stop Cobden from activating the Krotons - who now intended to use The Doctor to supervise the mental processing of the humans - The Doctor gained a lucky break when the exposure of service technician Romilly to the Krotons in their protoplasmic state resulted in the one-in-a-million creation of a human/Kroton hybrid, Romilly subsequently using his computer expertise to create a programme that would cause the atmosphere generators to build a super-dense atmosphere bubble throughout the tunnels, failing to realise due to his insanity that this would destroy everyone on the planet rather than just the Krotons. As Romilly clashed with the other Krotons as the programme was activated, The Doctor managed to reach the atmosphere generator and reprogram it to generate a high-pressure atmosphere while filtering out the oxygen, thus giving all the humans hypoxia. With lack of oxygen making the humans overconfident and stupid, the resulting fluctuating energy spikes caused the Krotons to overload and collapse, leaving The Doctor - whose respiratory bypass system left him better able to cope with the lack of oxygen - to reset the generators to normal. The Krotons’ last encounter with The Doctor was particularly personal, not only because they arrived in a stolen Dalek ship, but because they were attending an auction for a valuable Relic which was later revealed to be the body of none other than The Doctor’s own thirteenth incarnation, killed in a war with a mysterious enemy whom the Time Lords would confront in the future. 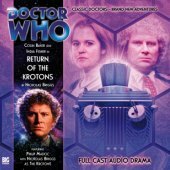 Having recently suffered their defeat at the hands of the Sixth Doctor, and with their recent capture of a Time Lord agent, the Krotons sought an advantage over the Time Lords, infiltrating the auction to make their own bid for the Relic. With tensions among the bidders at the auction already strained - the biodata of the Thirteenth Doctor could tip the scales of the war due to it being the only remaining physical trace of a Time Lord president, hence meaning that whoever controlled it could access lost Gallifreyian secrets and weapons - matters became worse when the Shift - a being of pure concept and an agent of the Time Lords’ Enemy - infiltrated the mind of E-Kobalt, the Kroton commander, driving the Krotons to attack the auction and forcing the other bidders to flee by using E-Kobalt’s anger at the other bidders’ dismissal of the Krotons’ efforts. Using a Faction Paradox shrine - a primitive TARDIS controlled by voodooesque rituals - The Doctor materialised around the Kroton Warspear of six ships that had been dispatched to enforce their demands for the Relic. When E-Kobalt ordered the Warspear to attack, the shrine’s indestructible interior caused the weapons to rebound and destroy their source. The Doctor subsequently used the Shift to trick the bidders into giving him the Relic, destroying it to prevent anyone from using his biodata.